If breakfast is the most important meal of the day and French cuisine is one of the most important culinary traditions in the world, then, by simple reasoning, breakfast in France should be one of the most important meals ever. I’m not sure about all of that, though given their penchant for cafes, coffee, and pastries, I wouldn’t bet against it. What I do know for certain is that Epcot’s France pavilion is open for breakfast and not nearly enough people are taking advantage of this wonderful hideaway. Just about everything on the menu or in the display case at Les Halles Boulangerie-Patisserie can also be had for lunch and dinner. This means that, if you were so inclined you could have a cheese plate, macaron, or Napoleon for breakfast. It may give you a sugar rush to make it all the way up to Test Track in record time, but you will eventually come crashing back down to earth, probably before you make it over to Mission: SPACE. For our breakfast rendezvous, we opted for a pair of more traditional breakfast items, the Croissant Jambon Fromage and the Roulé Lard and Fromage. 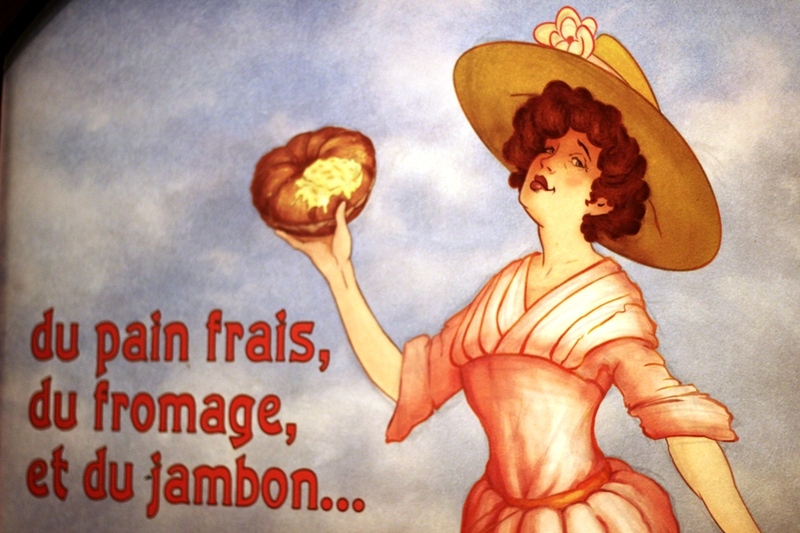 Before we go any further, let’s simplify the names for everyone, the Croissant Jambon Fromage is a ham, cheese, and béchamel sandwich in a croissant. Similarly, the Roulé Lard and Fromage is a bacon and cheese roll. For having to be cut and stuffed, the croissant is still as airy and flaky as you would expect a croissant to be. Some of the cheese, a variety of Swiss based on the flavors, and the béchamel have escaped around the edges of the croissant and have bubbled and blistered up to form a great little crust of cheese. 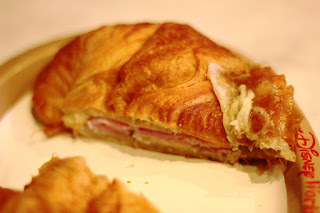 Inside the croissant, the cheese and ham have been thinly sliced and layered upon a just as thin coating of the béchamel sauce. This sandwich has flavors that are mild enough not to shock the palate first thing in the morning, but hearty enough to keep you going until lunch, or that mid-morning snack you know you’re going to want. The bacon and cheese roll on the other hand has a much more pronounced cheese flavor and the bacon is hard to miss. 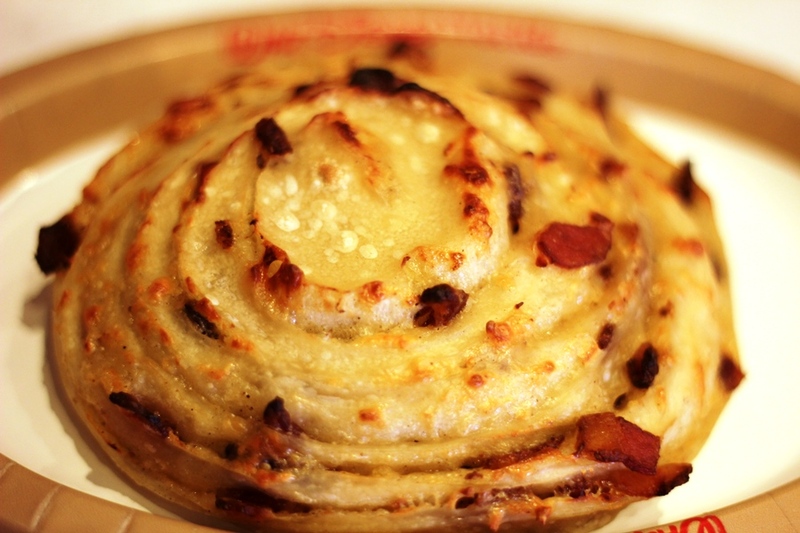 The bread component of the dish is dense and hearty, think of it as a savory cinnamon roll. The cheese smothers the top of the roll and is a notch stronger on the cheese scale than the croissant’s cheese, but not so much that it would deter almost anyone wishing to consume this pastry. The bacon is crumbled and scattered on top of the roll, held in place by the cheese. It has a nice flavor, but I would have expected a thicker cut or something more than Disney breakfast bacon for this one. Les Halles Boulangerie-Patisserie is a treasure trove of pastry goodness no matter what time of day you visit. The fact that this bakery is open for breakfast still seems to be a fairly well kept secret as crowds are often minimal here in the early hours of the day. I highly recommend that you do yourself this favor: grab a cup of coffee or a latte, your favorite breakfast pastry, find a table out on La Petite Rue, listen to the French music, and enjoy the classic French activity of people watching.